Studies have shown that when you are happy in the workplace, you are more productive and more likely to stay in a job. Many people are not happy with their job and don’t perform as well or they are only there for the money. Have you ever asked yourself if you are happy at your current job? Are you still working there because you have been employed with them for a while and you feel comfortable? Don’t get me wrong, but in my opinion, if you are going to be doing something for several years to come, you should at least be happy doing it. Before working at YES, I was a Dental Assistant for five years. I made “good money” and was comfortable where I worked. I did not want to take a risk and was afraid of not liking other workplaces. I also was scared of rejection from new coworkers. I felt like I lost a lot of good opportunity. As a dental assistant, I loved interacting with patients and making them feel better about themselves. Unfortunately, I wasn’t exactly content with my job, I was only comfortable. Having to wake up for work every day was getting dreadful for me. I always kept thinking to myself; Is this something I want to do for the rest of my life? The answer was always no. I was also not performing my very best anymore and I knew that I needed to take a risk and explore my options. Maybe there was something out there that I would really enjoy and would be a better fit for me. This was one of those thoughts that made me nervous but I decided to act on it and make the change. It was not the easiest decision, but it was one of the best I have ever made. I found a great position here at Your Employment Solutions working as a recruiter. I immediately noticed that I no longer dreaded waking up in the mornings for work. Helping people was something that I considered very important and with my position I was assisting people with employment. The environment in my new job was amazing and the people were nice. Currently I find myself learning new things and gaining new skills and experiences that I know will help me in life and in the future. This is definitely a decision that I do not regret. From experience I can now offer this advice. 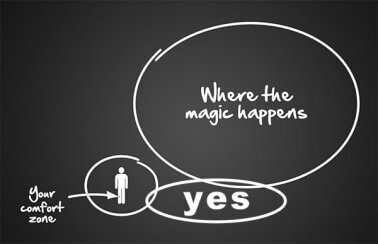 If you are unhappy where you currently work, do not be afraid to go out of your comfort zone and look outside the box. I sure am glad that I did. I now LOVE what I do and the people I work with! Sometimes taking a risk is necessary and the outcome is a great one! Cesia is an account manager and recruiter at Your Employment Solutions in North Salt Lake, Utah. She specializes in helping people find good jobs in Utah.